Tags: Focus, goals, results oriented workplace, sales, life improvement, entrepreneurship. You’re too busy to do everything you want to do. You’re so stretched on so many things you can’t do anything well. You’re thinking about what goals to set for yourself and need some direction. The surprisingly simple truth behind extraordinary results is that you’re trying to do too much, and you need to do less. Specifically, you need to do one thing. What is that one thing? It’s not a specific thing. It could be anything. Just make sure whatever you’re doing, it’s one thing, and not two things. That is, not two things for each area of your life, and if you have too many areas of your life, maybe you need to cut out some of those. Ok, of course there’s more to it, or the authors would have just tweeted out their advice instead of writing a book about it. It’s trickier to focus than you would think. What the authors show is how to cut through all the extra stuff in your life that isn’t necessary and figure out what matters and what doesn’t. And yeah, they don’t actually advocate doing just one thing, because we all have to do lots of things, but for example, what’s the one thing you could do in the area of “health” that would have the biggest effect? Focus on that one thing and master it. Then move on to the next thing. Don’t try to bite off 10 health improvements at once. 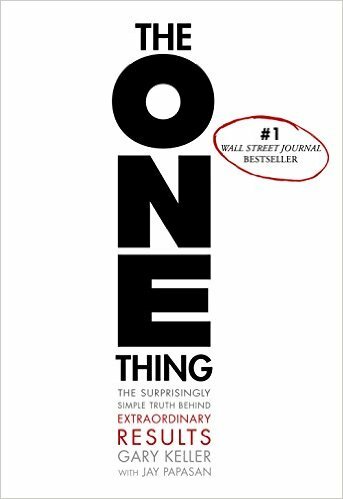 If you’ve read Essentialism, The Obstacle is the Way, The Power of Less, or The Life-Changing Magic of Tidying Up, and you enjoyed them, add this to your list. You’ll enjoy it, too.